One of the things that always amazes me when I have to leave the monastery for a medical appointment or for an errand (which is not too frequently) is to see our monastery sitting on the top of the Berkshire Hills. Although in the summertime our building is barely visible through the trees, in cooler weather I can see it more clearly. And I am in wonderment that we are here in the Berkshires and that where at one time there was only woods, now there is a monastery dedicated to the Two Hearts of Jesus and Mary. That’s what we decided to name our monastery, calling it Mont Deux Coeurs—translated from the French, it means Mount of the Two Hearts. Anyone walking into our chapel, can’t miss the stained glass window high up over our sanctuary proclaiming that theme in its symbols of the Sacred Heart of Jesus and the Immaculate Heart of Mary. We wanted everyone to know that being in this building, they are under the auspices of these two holy Hearts. Saint Margaret Mary had from her childhood a great love of the Blessed Virgin Mary. One of her first experiences of Mary’s motherly care was our saint’s healing from an unknown illness that confined her to bed for four years. We are told that her bones pierced her skin and that she nearly lost the use of her limbs. After physicians had failed to help Margaret, she was vowed to the Blessed Virgin. In her own words she tells us, “A promise was made that if Mary cured me I should be one day one of her Daughters. I had no sooner made this vow than I was cured, and I experienced quite a fresh protection on the part of the Blessed Virgin, as if I belonged wholly to her.” Margaret goes on to inform us that the Blessed Virgin made herself so entirely mistress of her heart that she took upon herself the absolute government of the young girl and even reproved her of her faults and taught her to do the will of God. Now all of us, can if we so desire, have access to the protection and guidance of our heavenly Mother. She is our Mother in the spiritual realm, be you sinner, saint, regular Joe, Protestant, Catholic, Jew, Muslim, Buddhist, pagan, or whatever. Whoever you are, whatever you are, the Blessed Virgin Mary is waiting to help you, intercede for you, lead you to Jesus and to your eternal happiness. Her Immaculate Heart is, as the Litany of Loretto invokes her, the Refuge of Sinners. Is there anyone out there who does not need a heavenly advocate to soothe over some pain or some unfortunate mistake of your past life? Mary is our supreme intercessor with the Sacred Heart of Jesus who always, always listens to her prayers. There is a photo in my breviary that was given to me several years ago of a statue of Our Lady in the garden of our Georgetown Visitation Monastery. She is depicted as decisively stepping on the head of a serpent that represents Satan. In today’s world, we can read about and can experience for ourselves, the phenomenon of the growing influence of the prince of darkness. 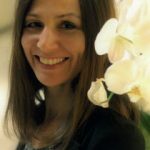 Young minds, curiosity seekers, those looking for alternative sources of empowerment and self-affirmation are attracted by New Age thinking and techniques that leave them vulnerable to Satanic persuasion and control. To offset this, we have only to turn to the Immaculate Heart of Mary. Satan hates the Blessed Virgin Mary. Remember the prophetic words in the Book of Genesis after the fall of Adam and Eve. God addresses Satan in serpent form predicting his ultimate doom. “And I will establish a feud between you and the woman, between your offspring and hers; she is to crush your head, while you lie in ambush at her heels” (Gen.3:15; Knox translation). Although some translations provide the masculine pronoun making the sentence “he will crush your head,” we see that the real meaning is that Jesus is going to crush Satan through Mary. She is the instrument Jesus has chosen to use to destroy His ancient enemy. Just imagine the absolute loathing Satan must have for this lowly servant of the Lord who will defeat him! Satan and Mary are polar opposites and every ounce of Satan’s hatred and bitter envy will be pulverized by the deep humility and gentle power of the Blessed Virgin Mary. No wonder Satan is on a rampage, wreaking as much havoc as he can, wherever he can — in families, in religious communities, inside the Church, in society, and in individual hearts. His time is running out and he is pulling out all stops to get his way. So my fellow strugglers, we must be on the alert! Where can we turn? To the Immaculate Heart of Mary — she does only what the Sacred Heart of Jesus wishes. We need not be embarrassed by our past failings to approach her, for she is a creature just like us. St. John Damascene says that Mary is not only the refuge of the innocent, but also of the wicked who implore her protection. 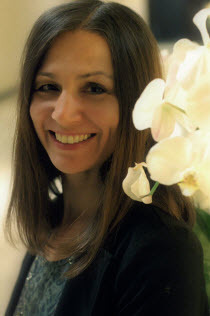 Her heart is so gentle, so compassionate, even toward the most despicable of us humans. And her intercessory prayers are incomparably effective before the throne of God. All of us who sincerely want to follow the Lord need protection from the onslaught of worldly values and from enticements that constantly allure us to wayward reasoning and behaviors. In the Letter to the Ephesians (6:10) we are exhorted to “put on the armor of God, so that you can take your stand against the devil’s schemes.” For our struggle, we read from this scripture passage, is not against flesh and blood but against the powers of this dark world and against the spiritual forces of evil. Therefore, our confident recourse to the Immaculate Heart of Mary, so close to the Sacred Heart of her Son, can help us overcome the obstacles of life that threaten us at every turn. Thinking about this, today I would like to suggest the use of a very powerful sacramental that can act as a spiritual armor for us. 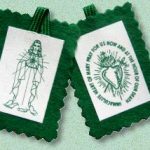 It’s called the “Badge of the Immaculate Heart of Mary” or the Green Scapular. It was given to the world by the Mother of God in a series of apparitions to Sister Justine Bisqueburu, a Daughter of Charity, in the early 1840’s in Paris, France. Mary appeared to the young nun while holding in her right hand her Immaculate Heart, mounted by flames, and holding in her other hand a scapular. 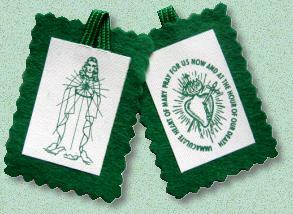 On one side of the scapular was an image of Our Lady; on the other side was an image of her Heart with the inscription: “Immaculate Heart of Mary, pray for us, now and at the hour of our death.” Mary promised that when she was invoked under this title and through this holy image, she would obtain great favors from the Divine Heart of Jesus, especially in the areas of physical health, peace of mind and spiritual conversion. Our Lady explained that the scapular was not like others, but only needed to be blessed by a priest and worn or carried by the one who wished to benefit from her intercession, with a daily recital of the short prayer on the scapular. This prayer could even be said for another, if the intended beneficiary of the scapular’s use would not say it. It is the confidence we placed in Our Lady and her Divine Son that makes this sacramental so effective in releasing grace.